I wanted to be five years old again. Since I couldn’t do that, I let my mind feel it. And it was wonderful to let go and feel the magic of Santa Claus in my heart once again. Even though it was last summer, Santa was there. By there, I mean Rovaniemi, Finland, way up in Finnish Lapland on the Arctic Circle, the official home of Santa Claus. I have been wanting to visit Rovaniemi ever since my girls visited there years earlier and couldn’t stop talking about the town, or Santa. It seems there has never been a more real Santa. 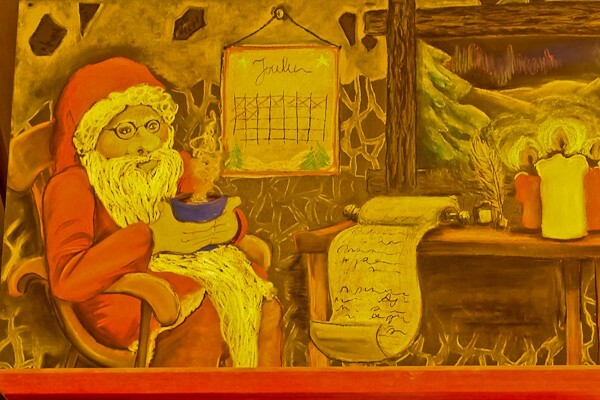 He not only looks like how we want Santa to look, but he actually speaks many languages and can communicate with wide-eyed children from all over the world who come to Rovaniemi just to visit him. The girls were astounded at how many languages he could speak, and how happy he made so many children who will never forget their visit with him. Rovaniemi is only about an hour flight from Helsinki, but like no other plane ride I have ever experienced. Finland is not a large country and it is mostly rural. Looking out the window while flying up north is like a fantasy land. Nothing but trees and lakes and colors that seem to glow. As we approached Rovaniemi, it didn’t even look like there was a town anywhere, only the most beautiful, endless view of the greenest trees I had ever seen. (Toto, I don’t think we’re in Kansas anymore). Then out of nowhere, a tiny little runway appeared and suddenly we were landing to experience the enchantment of Lapland. And Santa. We left the cute little airport, covered in Santa everything of course, and took a cab to the beautiful Arctic Light Hotel, which I will tell you about on Wednesday. Today is reserved for Santa. After checking in, we couldn’t wait to get into another cab and go to Santa Claus Village, about a 15 minute ride down the road. 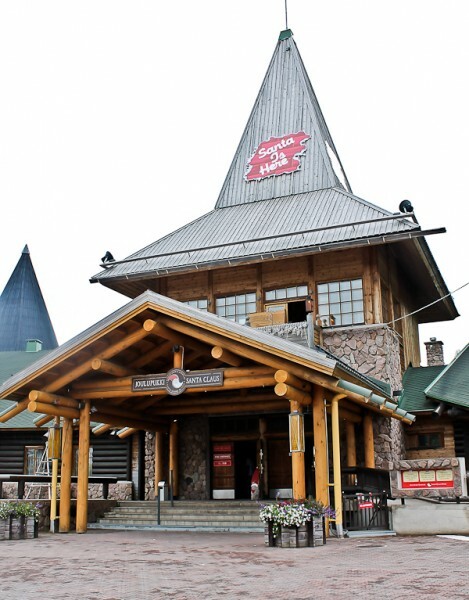 Santa Claus Village is a child’s paradise. Building after building of Christmas ornaments, gifts, candy, food, even live reindeer to pet. But of course they all head to Santa’s “office.” I can’t even describe the room where Santa sits and awaits the children. Unfortunately, no photos are allowed. Just close your eyes and imagine everything you would think it would be: Santa sitting up on a platform in a huge beautiful chair, or really, like a throne. The room sparkles. No other word for it. It takes your breath away. Christmas trees, presents, elves, and decorations fill the room. I can’t even imagine being a child and climbing onto this Santa’s lap. It would be surreal. He looks like everything you want Santa to look, sound, and feel. Yes, I am five again, if only for a few minutes. We went in because we wanted to see it all and I had hopes of taking photos, but the girls did go sit on his lap as they did before. Turns out, lots of adults turn five years old for a just a few minutes and go sit on Santa’s lap too! 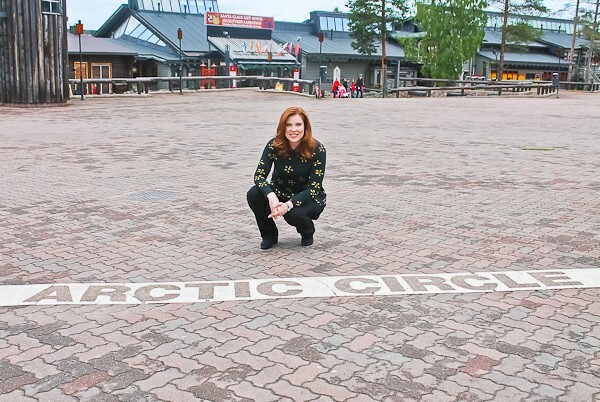 Outside of Santa’s building is the official line of the Arctic Circle and the tradition is to jump over it, or at least stand by it. And that the girls did too! We even have a photo on our Christmas card this year showing all of our feet touching the line. As you can see, there are stores everywhere in Santa Village, and you can believe I had the time of my life shopping! Oh, the treasures I found. My Christmas tree has many new ornaments, to say the least. I was in shopping heaven. I love Christmas decorations. There is a post office with tables set up for kids to write letters to Santa, or for adults to mail their Christmas cards from Santa’s official post office. After all the excitement and shopping, were decided we were hungry. 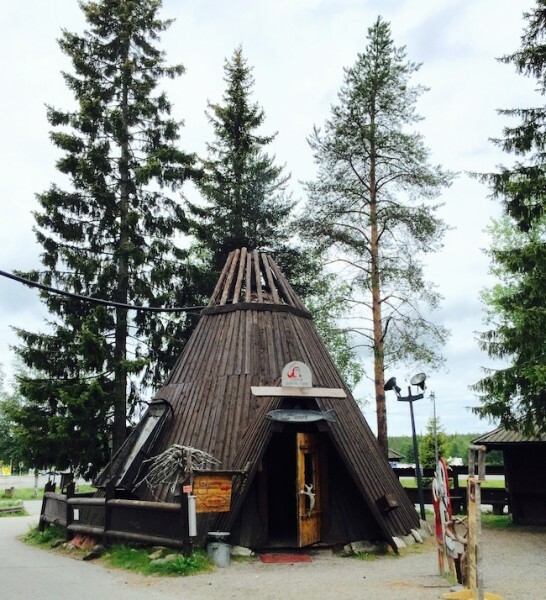 If you are ever in Santa Claus Village, here are two places to eat that you cannot miss, one traditional Finnish cooking and one more casual and modern fare. 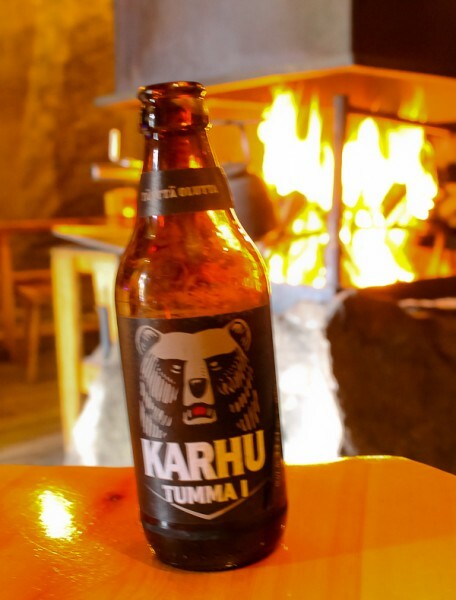 The traditional fare, which consists of fire-roasted salmon, potato salad, bread, and Finnish beer if you want it, is in a “Sami” tent. The Sami people, formerly called “Lapps,” are reindeer herders, living a semi-nomadic life in the Arctic regions of Finland, Norway, and Sweden. Sami’s are the original inhabitants of Scandinavia and most of Finland. 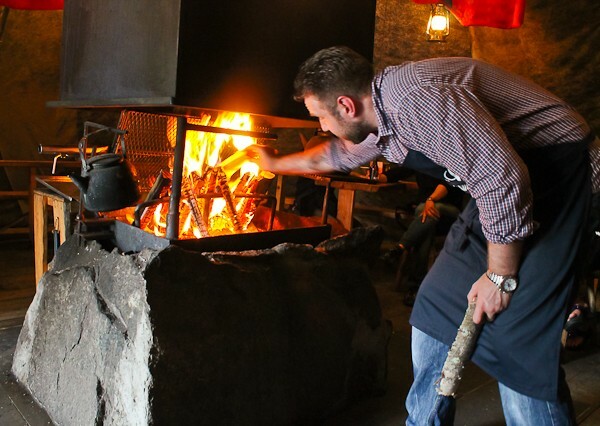 This Sami tent is a tiny little restaurant with only a few tables. 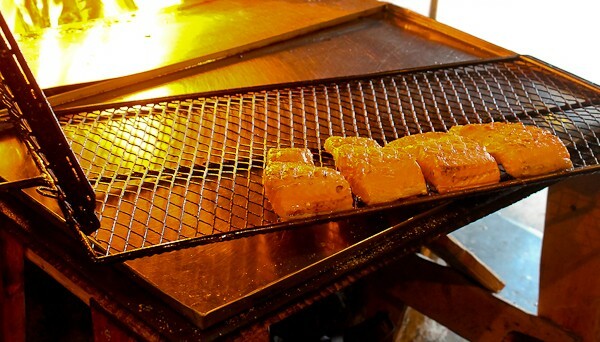 In the center of the tent is glowing fire ready to roast fresh salmon. 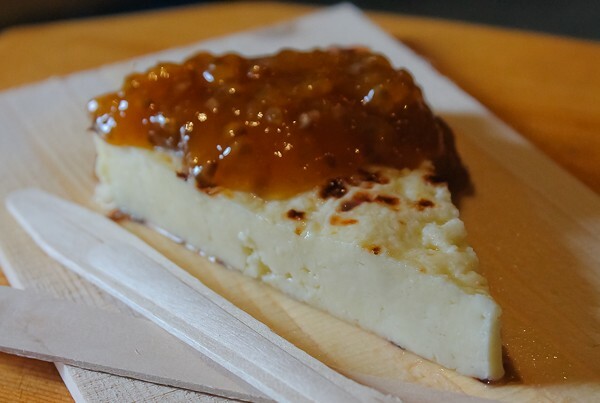 While waiting for the salmon to cook, we ordered the Finnish cheese, Jussto, which is cut into wedges and served with cloudberries. All the tables surround the fire so everyone sits and watches their dinner being prepared. 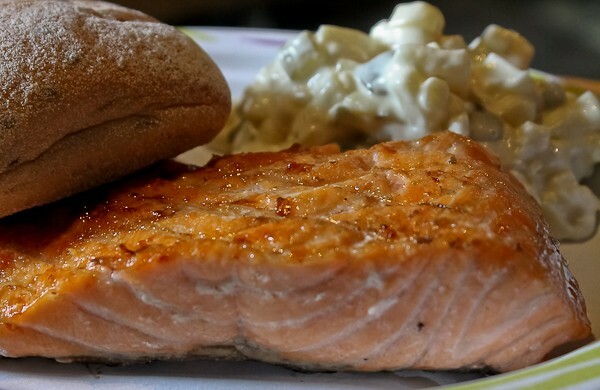 When the salmon is done, it is served with a potato salad and fresh rye bread. After shopping at the Marimekko store, we stopped at the Cafe Santa Claus right next to it because the most beautiful macarons caught our eye. There were colors and flavors we had never seen or tasted. The girls had recently been on a trip to France and said the macarons were better in the little cafe than the ones they had in Paris! 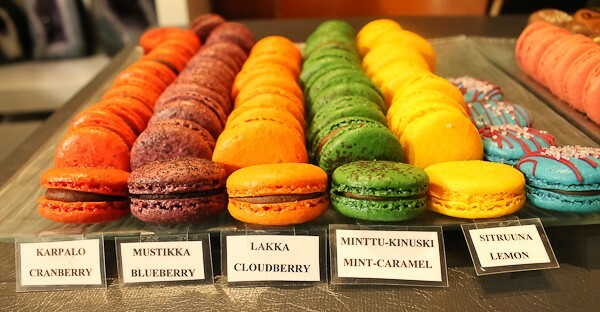 I had never seen salted licorice (Salmiakki) macarons before and they turned out to be my favorite. 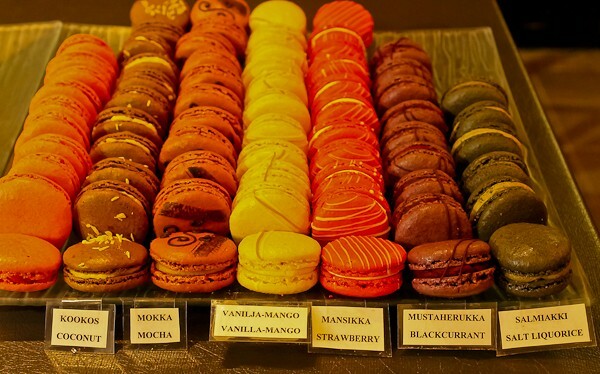 There is only one pastry chef who makes all the desserts, and there are many more from which to choose. We were astounded at what she makes by herself on a daily basis. 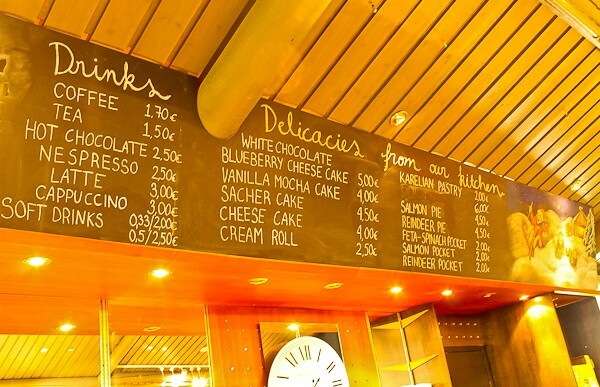 There are also great sandwiches, drinks, other items not seen here, but the desserts are what you will still be talking about long after leaving. After our exciting day, full bellies, and many shopping hours later, we were ready to return to our lovely hotel in town and get some rest so we could return tomorrow for yet more shopping, and probably another macaron. We arrived at our hotel, fell into bed, and had dreams of Santa. At least I did. That’s because a little part of my brain was still stuck at five years of age. That’s okay. There is nothing like experiencing some temporary magic at my age now! Wednesday’s blog will be all about our cozy boutique hotel and the town of Rovaniemi. Wait until you read what the restaurants serve for dinner.